Low Carb Chicken Souvlaki Bowls – the perfect healthy, low carb 30 minute dinner bursting with Mediterranean flavors. Best of all, it’s full of fresh bright flavors with tender chicken, grilled vegetables, olives, feta on a bed of cauliflower “rice”. With summer just around the corner, I am always on the lookout for more meals we can make on the grill. This Low Carb Greek Chicken Souvlaki Bowl is packed with healthy vegetables and bursting with Mediterranean flavors. 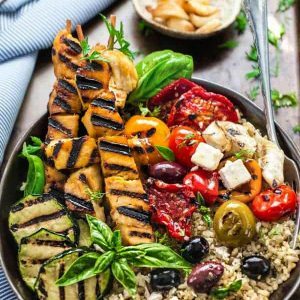 We swapped out the usual rice pilaf and potatoes with cauliflower “rice” and tons of colorful grilled veggies. It’s quick, simple and perfect for those warm summer weeknight meals outside on the patio. And you can easily customize this with your favorite protein like turkey, beef or even shrimp. Start off by marinading the chicken in a large zip-top bag. 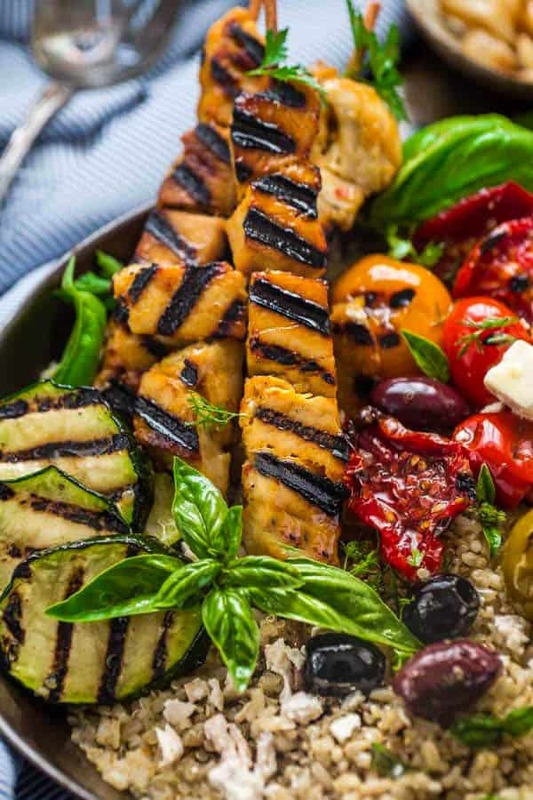 For an easier make ahead option, you can combine the marinade and prep the chicken the night before so that all you really need to do is grill and assemble the bowls before you sit down to dinner. Once your chicken is ready for the grill, thread them onto skewers and grill on medium high heat. Chop and prep the vegetables then add them to the grill. The great thing about this recipe is how easy it is to customize with what you have on hand. I used zucchini, sun-dried tomatoes, cherry tomatoes, Kalamata olives, green olives, fresh herbs and some feta cheese. If you have some asparagus or broccoli, you can toss those onto the grill as well. These bowls are also gluten free, low carb and keto friendly. For a paleo or dairy free option, leave out the cheese and Tzatziki sauce. Low Carb Chicken Souvlaki Bowls - the perfect healthy, low carb 30 minute dinner bursting with Mediterranean flavors. Best of all, it's full of fresh bright flavors with tender chicken, grilled vegetables, olives, feta on a bed of cauliflower "rice". Add marinade ingredients to a large zip-top bag and add chicken. Seal bag and using your hands, press down on the chicken to distribute marinade evenly. Refrigerate for 45 minutes to 2 hours. 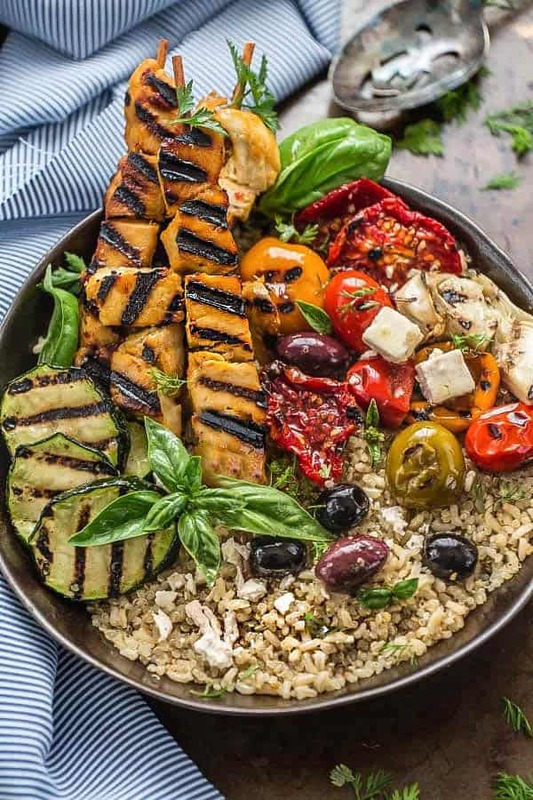 While the chicken is grilling, toss the zucchini, bell peppers and tomatoes onto the grill and cook for about 3-4 minutes on each side, or until desired doneness. Divide the cauliflower rice among bowls. 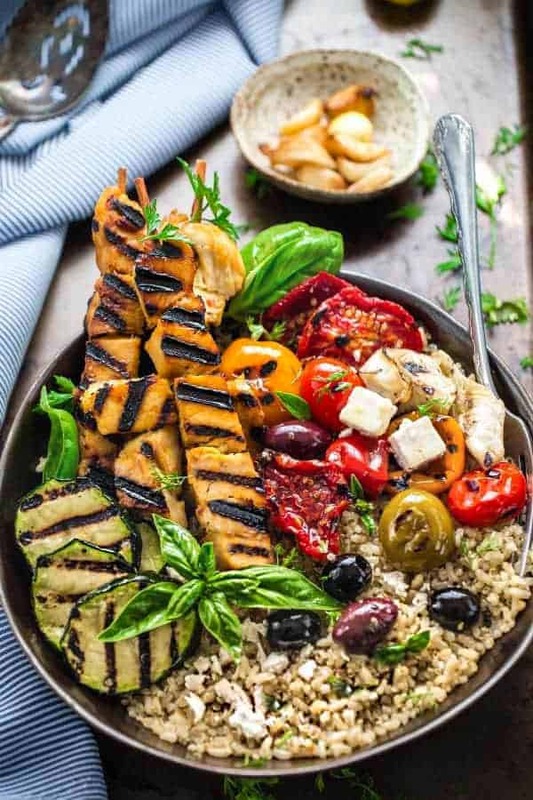 Top with grilled vegetables, olives and chicken skewers. Sprinkle with feta cheese and serve with optional toppings as desired. Combine all the ingredients by hand or a blender (if you want it smooth). Cover and refrigerate until ready to use.